Susie Harris: I married a 12 year old! My precious was given this beautiful pillow case by his Mother. His mother that is very into decorating and house could be seen in Southern Living. He sleeps on it every night now. I had Holly Hobby and Ragedy Ann and pink and green plaid (yes I did) but you dont see me sleeping on them. I knew she had it out for me but this has gone a bit too far. What am I going to do about this little issue you may wonder....Smile! It's great to have a heart like a child. I want to be more like him and HIM !!! his momma got him the pillow bc he doesn't live with her anymore! Being happy should take precendence over many things...give him this bit of child like play. That's funny and you are very sweet to go along with "his" decorating theme. I think we sometimes get so wrapped up in how everything looks and our need for the perfectly decorated, that we forget that other people need to LIVE in the home and enjoy it. So true! Mother-in-laws seem to have a knack for that kind of thing. I can't believe Maddy got a kitten. Do you have any kitten stories???? I hope she is not as wild as my Midnight. Do post about her please. Oh you poor thing! Hide it under the other pillow shams! Your not living in Arkansas, right?? I have to get some white plates!! 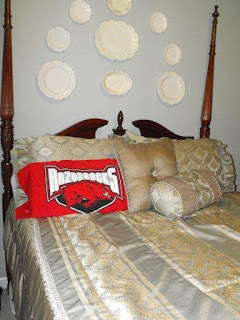 I totally agree...but I think I would have to add those GA Bulldawgs instead...lol...you know I have that in me to but at least it hasn't hit my bed yet...I did do a bedroom that way though...I love my bulldawg room. I love the fact that you let HIM keep it...that's so cute even thought the mascot and colors are terrible! How funny. I like the way you ended your post. I have to agree, and remind myself now and then about making a home be a home not a showroom for myself! eww weeee susie. my word. well its his home too, whatever makes him happy. Mine runs around in some nice casuel clothes and some big ole purple and gold crocks...lol. I mean the man is obsessed, well not as much as me, but still, its a bit much. I love my purple and gold, so here's to Marc and his red and black, no matter how hidious it may be!!!! hugs Marc! Ha Ha! Yes, I know about the mind of a 12 year old...but my decor is being transformed (well, at least is trying to be transformed) into camo. Not! Hilarious. You are probably a touch nicer than me - ha! DH gets all the decorative license he wants in the MAN CAVE! And you can totally tell. Every now and again he will ask me for help. At least he has great taste in teams - Go Hogs!!! 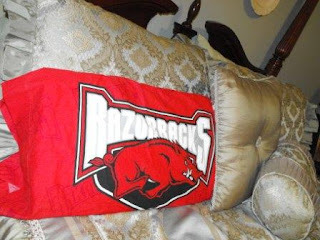 I totally understand when it comes to a husband who is a HUGE Razorback fan. 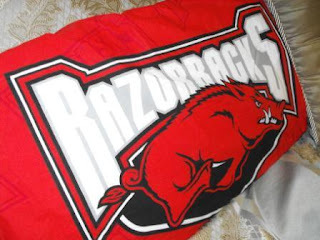 But, I make my husband keep all of his Razorback stuff in his office. 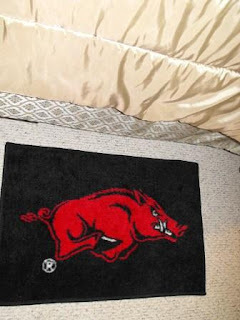 I have friends who have the complete Razorback bedding set, so it could be worse! 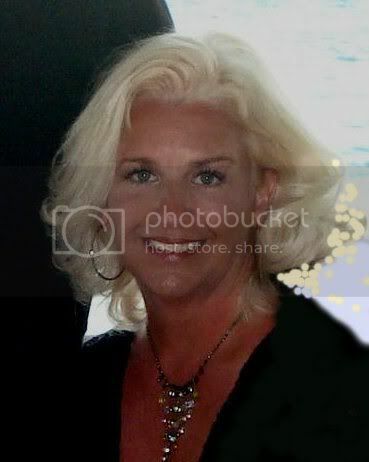 so proud of you for putting your love for your hubby above your love for beauty. the prettiest bedroom is nothing without love of the two who share it. You are a sweet and indulgent wife. Great point. You look at so many of these perfectly decorated show rooms and wonder does anyone have a real home. I'm glad to see you do!!! We have the same dilemma in our house. Only it involves Ohio State. I need to learn that lesson!